Ball dahlias are quite simply a visually astonishing plant. It is a true testament to nature that such a beautiful type of flower can exist. As the name suggest, these dahlias have flowers that take on the form of a ball. Flowerheads are double, with a slightly flattened top. Petals are arranged in a spiral pattern and the tips are blunt or rounded. Ball dahlias come in a range of sizes ranging from miniature (less than 10 cm or 4 inches) to small (10 – 15 cm or 4 – 6 inches). Barberry Carousel – this is a good dahlia for exhibitions. It produces small flowered blooms which are a lilac and purple blend with a white base to each petal. The plant grows to a height of 1.2 metres (4 ft) with a 60 cm (24 inches) spread. Flowers will be 10 – 15 cm or 4 – 6 inches wide. 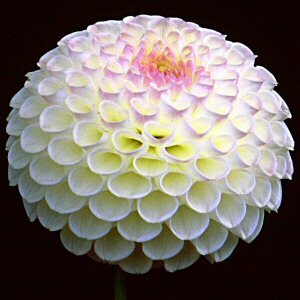 Wootton Cupid – this is a miniature ball dahlia which produces blooms that are approximately 2 inches (5cm) across. The flowers are a delicate candy pink colour and they grow on long, tall stems, well above the foliage. The plant reaches a height of 1.1 metre (3 ft 6 inches). This is also a good choice for exhibitions and shows. Rothesay Superb – this is a good choice if you like plenty of flowers to bloom. The flowers are bright scarlet and miniature ball-shaped. This plant grows to a height of 1.1 metre or 3 ft 6 on a strong stem.